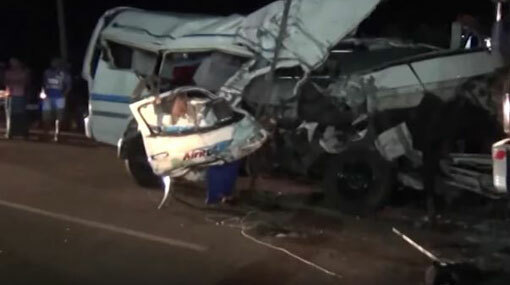 Four persons have been killed while five others sustained injuries in a head-on collision between a van and a tipper truck that had taken place at around 1.45 a.m. this morning (18). The two vehicles have collided in Nagawilluwa area on Puttalam-Colombo main road, the police said. The van, which had been en route to Colombo from Jaffna, has collided head-on with a tipper truck arriving in the opposite direction. Nine persons including the driver of the van and a passerby were admitted to the Puttalam Hospital following the accident. However, it was reported that the passerby and three others succumbed to injuries. Five injured persons are currently receiving medical treatment at the hospital. According to hospital sources, the injured are not in critical condition. The driver of the tipper truck has been arrested over the accident. Puttalam Police is conducting further investigations regarding the incident.